The Ministry of Industry and Trade is preparing an amendment to the Investment Incentives Act. The changes govern the current investment incentive settings. 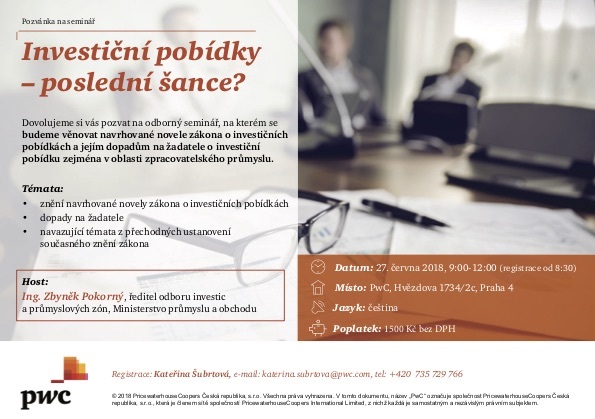 Since these changes will represent a significant limitation for the acquisition of the incentives for investors in the manufacturing sector, PwC Czech Republic has organized a specialised seminar covering this topic. You can look forward to a special guest Zbyněk Pokorný, Head of the Department of Investments and Industrial Zones of the Ministry of Industry and Trade. Furthermore, during the seminar, our tax experts will clarify the text of the proposed amendment, its impact on the applicant and all new information that will help you prepare for the forthcoming changes in time.